SERIOUS Investing: Is TA really a stockbroker? If you were to ask most old-timers, what is the TA brand associated with? Stockbroking. I can be quite sure for those who were into stocks during the 80s and 90s, if I were to ask what TA does, they would still be associating the company with stockbroking. Many have made a lot from the stocks and so were many others whom got burnt from the stock as well. TA used to be the top stockbroking firm in the country with a very strong retail arm. It was probably the Public Bank of the stockbroking firms. We of course know what happened to all these stockbrokers - some collapsed - while the rest of the survivors faced very tough operating situations due to lowering of trading rates and probably lesser trades in the last 10 years. TA itself faced its own internal issues as the controlling shareholder - Tony Tiah was barred from being a broker for some number of years. However, it does not deter the company from operating as the other alphabet of the namesake - A which stands for Alicia - was still around. I seriously have not been looking at TA as I thought that it just vanished out of the stockbroking business and let others like OSK, HDBS - a smaller names during then to overtake the TA brand name. I think most people would be thinking the same too. However, probably as TA as usual would have foreseen and knowing what lies for the stockbroking business in the future during then, today TA is no longer a prominent stockbroking firm and it seems like it does not intend to be so. The TA Enterprise stock is still within the financial sector but in actual fact it should not be. I think many would be surprise if I were to show the charts below. Assets from stockbroking is just a fragment of its total assets. Hotel is by far its main business along with property development - and those are parked under a listed subsidiary called TA Global Bhd. Then are Tony and Alicia whom have been stockbrokers throughout most of their lifetime great hoteliers? I don't know but what I know is that the hotels TA owns are actually managed by professional brand names such as Movenpick Phuket, Radisson Sydney, Westin Melbourne, Swisotel Singapore, Swisotel Kunshan China and a lesser known Aava Whistler Canada. Hence, they do not need to be great hoteliers. This however does not mean that they own the brand Movenpick or Westin but TA Global owns the hotel. Those names are the management companies. Fantastic. As this opened up my eyes as stockbroking is much different from hoteling. Hotel business (if picked right) is sustainable and consistent and with the slow growth rate (or could be fast pick up, sometimes) of premium properties, and suddenly this is not a bad stock. Stockbroking is different in the sense that we are not able to predict what's the future for the business as its revenue is too volatile. 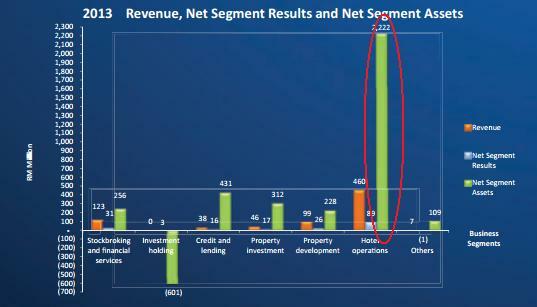 But yet TA Enterprise, although a hotel stock is trading like a stockbroking stock in terms of pricing. The moving into another sector, I think these are just luck due to the difficulties that were faced by the management after the crisis or could it be another of their long foresight. During the boom of the brokerage firms, TA was the most prominent stockbroking house - see the relation. Where the rest were only to pick up, TA was thriving. Today, as I can see it - it will no longer be the best hotel stock in town (that goes to Shang with a little support by Aberdeen Asset Management purchases or recent times) but it does not sit still. TA Global under TA Enterprise is still hungry as I can see it as it continues to rack in hotels at premium places, except Kuala Lumpur. Looking below, its assets are spread out and that is good for diversification. Malaysia is just 35% of its total assets and I believe most of those are the stockbroking and development property assets. Compared to the same type of chart in 2011 as below, it seems like TA is going overseas. In 2011, its Malaysian assets consisted of a much higher 44%. Now, at RM0.69 (although had some run recently), its market capitalisation is RM1.18 million, TA is still trading at more than 30% below its Net Asset Value and I think with the consistent revenue and income stream from hotel business with some hope of asset appreciation from properties, suddenly the supposed to be stockbroking firm is still attractive yet again. It also has a decent dividend policy as below. Seems to me that TA has just gone ahead of the rest (like HDBS, OSK, Avenue etc) whom used to be competitors are now selling their brokerage firms at slightly above NA value, TA is just going ahead with focusing on something else. Whether it sells its brokerage firm or not, and if it does, it does not matter as it already has a bigger fish to fry - that is picking the right hotel at the right places. it is categorized as a travel and lodging stock in bloomberg!